The Cuisinart 77-35CG Chef's Classic stainless steel 3 piece steamer set includes one stainless steel 3-quart saucepan, one stainless steel steamer insert and one tight-fitting glass lid. The steamer saucepan features stainless steel surface that won't react to acidic foods and includes an aluminum encapsulated base for quick and even heating. Easy to clean and dishwasher safe. The 3Qt Steamer 3Pc Set Chefs Classic Stainless has many exciting features for users of all types. 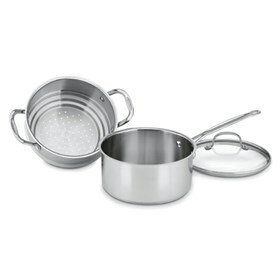 See the 3Qt Steamer 3Pc Set Chefs Classic Stainless gallery images above for more product views. The 3Qt Steamer 3Pc Set Chefs Classic Stainless is sold as a Brand New Unopened Item.